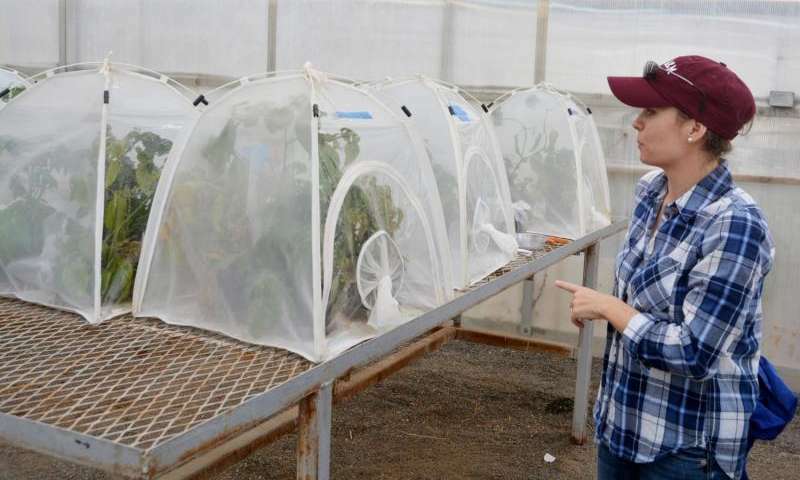 Dr. Ada Szczepaniec, AgriLife Research entomologist in Amarillo, said while there may be varying degrees of resistance to neonicotinoid insecticides in populations of psyllids across Texas, her recent study indicates they've lost their punch. "We are able to provide strong evidence that these insecticides no longer suppress populations of psyllids below desirable levels," Szczepaniec said. "However, there may be some biological control measures to help in this ongoing battle against the potato psyllid." The potato psyllid is a tiny insect with sucking, piercing mouthparts that transmits a bacterium, Candidatus Liberibacter solanacearum or Lso, which causes a disease called zebra chip and can cause tremendous losses to producers, she said. Producers have used the neonicotinoid insecticides to protect their solanaceous crops, mostly potatoes, in the past. Szczepaniec said the study, funded by the Texas Department of Agriculture, indicates applications of neonicotinoid insecticides at planting, which are a considerable cost for producers, should be replaced with investments in post-emergence applications of insecticides other than neonicotinoids. Integrating predators in suppression of psyllids could also be considered, especially when incidence of Lso is low and the threat of zebra chip disease is decreased, she said. However, more research is needed before recommendations regarding biological control can be made. Her study included colonies of the potato psyllid from all major potato-producing areas of Texas. These colonies were established and maintained in the greenhouse for at least two generations before experiments examining their resistance to neonicotinoid insecticides began. "Over the course of a year and a half, we completed testing the majority of the populations of psyllids for resistance to imidacloprid and thiamethoxam," Szczepaniec said. Based on the Insecticide Resistance Action Committee definition of resistance, "heritable change in the sensitivity of a pest population that is reflected in the repeated failure of a product to achieve expected level of control," the potato psyllid populations across Texas are resistant to both neonicotinoid insecticides, she said. Szczepaniec conducted a second study to identify alternative biological controls. Surveys of all arthropods associated with three different potato types – a russet, a red and a chipping variety – were carried out at the AgriLife Research station near Bushland. "While we have only one year of data to draw our conclusions, the survey has revealed trends in predator abundance that have important implications for potato production," she said. 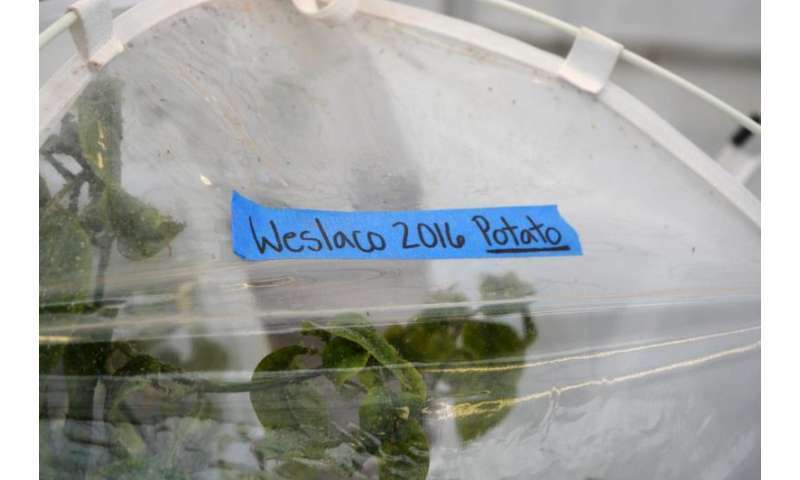 "First, potatoes harbor a relatively diverse group of predators, and minute pirate bugs in particular are associated with potatoes throughout the season," Szczepaniec said. "This is important because they were identified as key predators of the potato psyllid and their presence is important to suppression of the psyllid." She said other predators included long-legged flies, which are generalist predators, lady beetles, spiders, parasitoid wasps and syrphid flies. Russet potatoes had the highest prevalence of predators. Second, Szczepaniec said, it was important that minute pirate bugs were strongly correlated with thrips, which were also abundant in potatoes throughout the season. 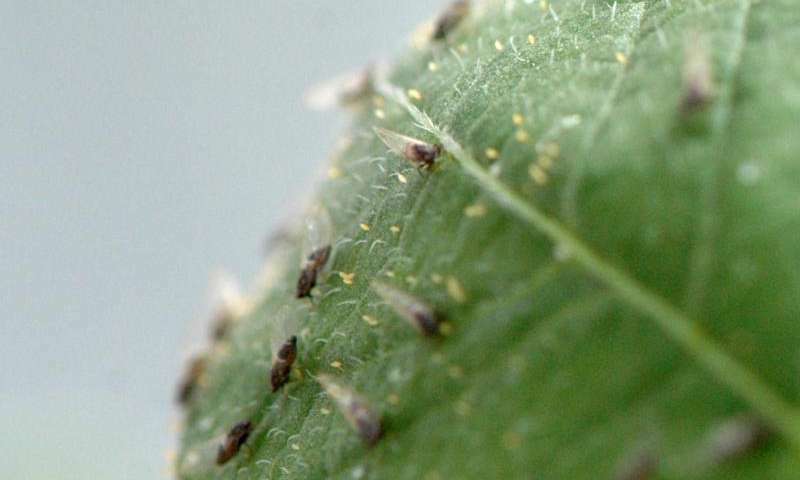 Minute pirate bugs are highly attracted to thrips, which are not key pests of potatoes. "So, it appears that the secondary pests, thrips, may help support a resident population of minute pirate bugs that can suppress the primary pest, potato psyllid," she said. However, Szczepaniec did not encounter significant numbers of potato psyllids in the survey, thus the impact of these predators on psyllids could not be established. It is likely, though, that if minute pirate bugs are present, it would inhibit colonization and suppress numbers of the potato psyllid. "When the cumulative numbers of predators were examined over the sampling period, we noted relatively high initial numbers of lady beetles and minute pirate bugs that decreased in abundance immediately following a broad-spectrum insecticide that was applied to suppress grasshoppers," she said. "This trend is not surprising and it validates our decision to survey potatoes in a field at our research farm that is not subject to an intense insecticide management program." Szczepaniec said while a transient influx of generalist predators can have an impact on pest suppression, the persistent presence of resident populations of generalist predators is key to effective biological control. "We know managing the potato psyllid and zebra chip disease will require a comprehensive and integrated approach going forward, and this research successfully establishes one class of insecticides as no longer effective in potato protection," she said. "Given the high incidence of the key psyllid predator, we believe integrating insecticide applications at lower intensity than weekly sprays with biological control releases may provide a viable option for psyllid suppression, especially when the proportion of psyllids transmitting the pathogen is very low," Szczepaniec said. She admitted that much research remains to be done in order to test the feasibility of this approach. The next most immediate research focus will be to identify if populations of psyllids across Texas are resistant to any other frequently used insecticides.